The Dark Knight on IMAX was spectacular... and the perfection continues on the Blu-ray disc edition that is awe-inspiring. For the uninitiated, the character of Batman was created in the late 1930’s by Bob Kane and Bill Finger which has spawned thousands of comic books, live action television series, cartoons, movies and a plethora of merchandise that has made this character a staple diet of pop culture. One of the most recognized super heroes of all time, the franchise was reinvigorated by Batman Begins in 2005 that was written by former comic scribe David Goyer and directed by Christopher Nolan which not only gave the franchise a breath of fresh air but successfully brought the character into the 21st century. The sequel, The Dark Knight is visually one of the most awe-inspiring movies that I have had the pleasure of watching and certain elements were filmed for IMAX that translates amazingly on Blu-ray... the quality is outstanding. Co-written by Jonathan Nolan and director Christopher Nolan that is based on a story by David Goyer and Christopher Nolan, The Dark Knight takes the viewer into the psyche of not only Bruce Wayne (Christopher Bale) as the Batman but also society itself which is a dark reflection of the world that we live in. From the very first moments of the film, you know that you are in for treat as it opens up with an orchestrated bank robbery, led by none other than the Joker himself. The Joker is played by the late Heath Ledger who truly captures the dark psyche of this character with his sociopath behavior and intelligence that makes him one of films most nerve racking villains. Ledger’s mannerisms for the Joker are brilliant from his twitches to the way he moves as if watching an almost ethereal entity. Nolan also highlights the relationship between the Batman and the Joker which is quite chilling as they are almost a mirror image of each other, however due to unseen circumstances, one is for order and the other for chaos. The story of The Dark Knight revolves around Harvey Dent (Aaron Eckhart) who in conjunction with the police force and police lieutenant James Gordon (Gary Goldman) wage war on the crime lords that run this broken city with the assistance of Batman. Unfortunately for Gotham, the Joker orchestrates a calculating strike on those involved to bring redemption to the city which forces Batman to make a life and death decision and go down a much darker path. Near the end of the movie, the story did lose me in some aspects and felt a little rushed and disjointed but fortunately my fears were resolved in the satisfying conclusion. 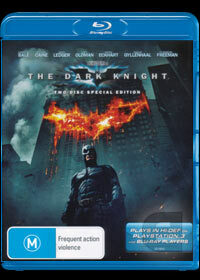 The Dark Knight features a healthy dose of thrills, action and a touch of romance. Christopher Bale is brilliant as Bruce Wayne and Batman, playing two distinct characters perfectly, one of a famous billionaire, the other, a masked vigilante with a gruff voice. As briefly mentioned, Ledger truly captures the soul of the Joker in one of his last complete performances and without spoiling the film any further, it is one movie that must be seen. Watching Ledger as the Joker tease the Batman in one of their battles with the Joker saying that Batman completes him is a classic scene. Visually, the film is quite a visceral action movie and my only complaint about some of the scenes is that they are quite dark and the camera moves dangerously fast which makes keeping up a little difficult at times. The video is perfection on Blu-ray and is a true reference disc. Apart from the impressive visuals, the score by Hans Zimmer and James Newton Howard rounds this movie up nicely, especially when experienced through Dolby Digital TrueHD 5.1 which needs to be heard loud and through a decent surround sound setup. When it comes to extras, the movie is littered with a great bonus disc that goes beyond the movie and truly into the psyche of the character called Batman. Needless to say, it's probably the most enjoyable extras that I have had the pleasure of watching. In conclusion, the Nolan brothers give the viewer one of the most realistic comic book adaptations of Batman that features first class acting, stunning visuals and a story that is both relevant and enjoyable. A must have Blu-ray disc!